Time Trip – Fill ‘er Up! I am old enough to remember gas station attendants. Barely. Pull up to the pump. Boy (always a boy) comes up wearing a shirt and pants of a particular shade of blue. He smells of fuel. On the chest of the shirt is an oval tag with his name stitched on. A simple, short name, such as “Bob,” “John” or “Mike”. The kid activates the pump, sticks the hose in your car, pulls the lever, and locks it in place. You watch the dials spin. The dial that indicates the number of gallons just whizzes by, while the dial that indicates the amount of dollars performs a slow crawl You know–the opposite of today. While the gas is filling up, the boy cleans your windshield. You watch the squeegee swipe the splatted bugs away. The smell of gasoline drifts in the open windows, because you have no AC. Something clunks. The kid takes the hose out–dumping fuel everywhere and dousing down the side of your car–and hangs it back up on the side of the pump. You hand cash out the window. This amount includes the tip. You say, “Keep the change.” If you need change, it’ll be a while. He thanks you and tells you to have a nice day. In the 80s, the concept of the self-service gas station arose. There were different lanes for self-service and full service. Full service seemed to be a way to screw over old ladies, like my aunt, who was daunted at the idea of pumping her own gas and always paid extra for full service. 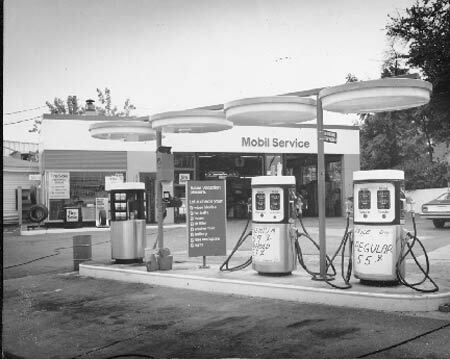 But eventually, even full-service went the way of the gravity-operated gas pump. This is easy–the service. Getting gas was a leisurely activity, during which you just sat there. Disadvantage? These gas stations weren’t a good place to grab a snack. The tiny room that housed the cash register only seemed to sell automotive things like cans of oil and windshield-wipers. And maybe cigarettes. They were not places where women–or girls–ever ventured (unless maybe, you smoked). Cold drinks were sold out of vending machines outside. Oh, and you could get gumballs. Eventually, they started advertising snacks for sale inside, which morphed into the modern convenience store. I came up with the idea for these Time Trips while writing my time travel novel, HIGHWAY TO YESTERDAY. For all the Time Trip posts I’ve written so far, click here.